Welcome to our wedding candle section. There is nothing more romantic and special than your wedding day. This day will be remembered forever by everyone who attends and we would like to be part of your special day. 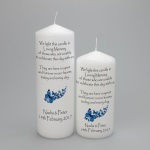 Whether you require a personalised Unity candle where the bride and groom jointly lights the main candle as part of the wedding ceremony, or Favour Candles for your family and friends we would be proud to make these for you. 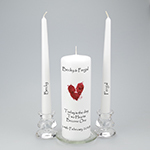 We can produce a range of quality hand decorated and personalised wedding candles for your special day. 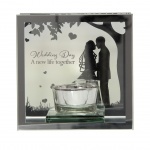 We have shown here our most popular choices but if you wish to personalise just that little bit more and would like something specific we would be pleased to discuss this with you. Please contact us with any special requests and we will let you know what we can do for you.